The SCU-025 is a supplemental, portable air conditioning unit that is designed to provide sub freezing air to aircraft in tandem with any large ACU. The SCU accepts cooled air from any suitable ACU and further cools the air to about minus 10°C (-15°F). This patented concept provides exceptional cooling efficiency while minimizing acquisition costs for subfreezing air systems. Equipment owners can continue to use their existing fleet of ACU’s in tandem with the SCU, resulting in a very low cost yet effective solution. The simple yet rugged design consists of a diesel engine directly driving a refrigeration screw compressor and condenser fan. 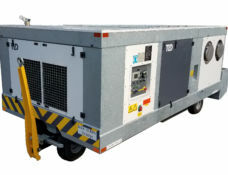 This is the unique “TLD Direct Drive” technology which provides more cooling for the same input power, and has a reduced part count, resulting in higher reliability and lower total cost of ownership. The belt driven condenser fan exhausts waste heat directly upward making the unit immune to performance fluctuations due to varying wind conditions and minimizing heat and noise radiated to the immediate ramp area.